Over the available sample period, VWUSX rises (falls) during 264 (181) months. The following chart summarizes average monthly premium allocations (determined at the end of the prior month) overall and when VWUSX rises (Market Up) and falls (Market Down) over the available sample period. An investor would not know whether equities will rise or fall for a month when setting the allocation for that month. 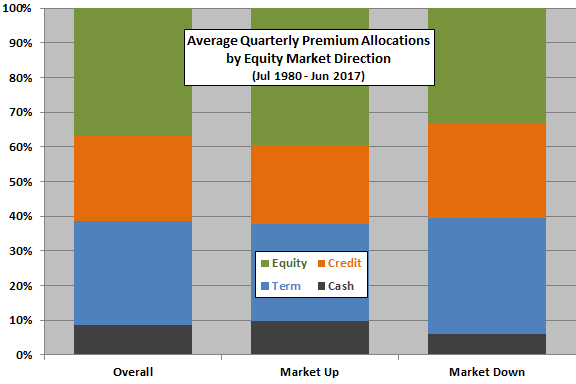 Results suggest that SACEVS tends to allocate more (less) to the equity premium and less (more) to the term and credit premiums just before stocks rise (fall). How do these findings about allocations translate to strategy performance? The 60-40 benchmark beats SACEVS Best Value and Weighted when stocks rise. SACEVS beats the 60-40 benchmark when stocks fall. An investor who could predict the direction of the U.S. stock market would prefer the 60-40 benchmark when stocks rise and SACEVS Best Value or Weighted when stocks fall. SACEVS underperformance when stocks rise derives from both a lower average monthly return and a higher monthly return volatility. SACEVS outperformance when stocks fall derives from both a higher average monthly return and a lower monthly return volatility. In summary, evidence from available data suggests that SACEVS works in part by avoiding much of negative stock market returns. Variables used to measure risk premiums in “SACEVS Applied to Mutual Funds” are somewhat different from those used in “Simple Asset Class ETF Value Strategy”. Per “SACEVS Applied to Mutual Funds”, strategy performance is sensitive to the lookback interval used to determine risk premium overvaluation/undervaluation. As noted, the above analyses ignore trading frictions. There may be none within a family of mutual funds. 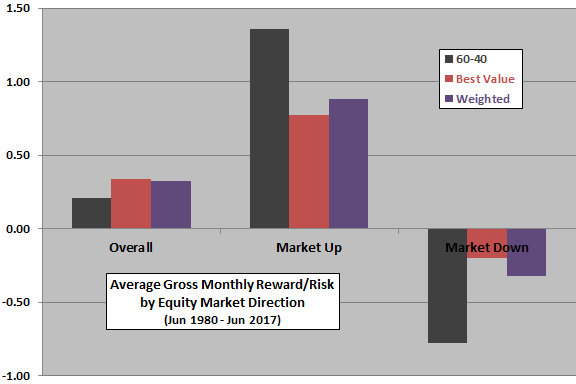 Other ways of measuring equity market direction may produce different findings. Other cautions in “SACEVS Applied to Mutual Funds” apply.